This antibody recognises the human CD62E and CD62P cell surface antigens binding to a common epitope on these members of the selectin family. This antibody inhibits neutrophil adhesion to E-selectin and to P-selectin. E-selectin (ELAM-1) is expressed on the surface of activated endothelial cells. Our Abpromise guarantee covers the use of ab6630 in the following tested applications. IHC-Fr Use a concentration of 1 - 10 µg/ml. WB Use at an assay dependent concentration. Non-reduced only. Cell-surface glycoprotein having a role in immunoadhesion. Mediates in the adhesion of blood neutrophils in cytokine-activated endothelium through interaction with PSGL1/SELPLG. May have a role in capillary morphogenesis. Contains 6 Sushi (CCP/SCR) domains. ab6630 staining CD62E in thrombin activated human peripheral blood platelets by Flow Cytometry analysis. Publishing research using ab6630? Please let us know so that we can cite the reference in this datasheet. I have also read the fact sheets for all, but to clarify, they are all suitable for IHC using frozen sections fixed with PFA? Could you please confirm the above? Effectively all of the products mentioned are suitable, and therefore are guaranteed for IHC in frozen sections in the species stated on their datasheets. However, instead of using PFA as a fixative, I would better suggest using acetone, methanol or ethanol at -20°C for 30 min, so the additional antigen retrieval step can be skipped. If, by the tissue’s nature PFA is required as a fixative, antigen retrieval is recommended to allow the antibody reach the epitope. All of our products are covered by our Abpromise® guarantee, which ensures that you can trust them, and they should work in the tested species and applications stated on the datasheet, or we will offer a replacement, credit, or refund, if reported within 6 months of purchase. I have a question regarding your anti-CD62E (E-selectin) antibodies, such as ab6630. Since E-selectin is localized to the cell surface/membrane, there should be no need to permeabilize cells for an immunocytochemical stain. Is this correct? Or is permeabilization necessary? Also, can you recommend a polyclonal anti-CD62E antibody that would be appropriate for whole mount fluorescence staining of human endothelial cells? Thank you for your help. You are quite correct. As CD62E is a single pass membrane bound protein, there should be no need to permeabilze the cells for an immunocytochemical stain. I have a question about you ICAM-1(ab2213), VCAM-1(ab19264) and ELAM-1(ab6630) primary antibodies. I am using a cell dissociation solution to (P-8 -- P-10) HUVECs from a T-75 tissue culture flash, normally takes about 10mins. after removal the cells are examined for presence of ICAM-1, VCAM-1 and ELAM-1 using antibody staining and FACs. I have used these antibodies at various concentrations (1ug/ul, 2.5ug/ul & 5ug/ul). the secondary antibodies used are IgG2a and IgG1 isotype and FITC conjugated (BD biosciences, 553456, 550616) respectively. these secondary antibodies have been optimised to prevent non specific binding. the primaries antibodies are incubated with the cells (30,000 ECs/well) for 30mins on ice. the cells are fixed with 4% PFA at the end of the protocol. to date I have not been able to optimise the primary antibody concentrations to give good results, i.e. a definite increase in secondary fluorescence compared to cells alone with no primary antibody and no secondary antibody. I would like to know if you know of any optimal conc. to use each of the primary antibodies and what addition steps that could be used to improve my results. it is possible that the cell dissociation solution is destroying any present adhesion molecules. I have received feedback from the source of ab6630 and ab19264 and would like to share their feedback. Unfortunately I am still awaiting feedback regarding ab2213. For ab6630 we would suggest a working dilution of 10ug/ml. For ab19264 we recommend to use 0.5 - 1µg antibody for 106 cells(I am still awaiting feedback from the source of ab2213 to find out the recommended dilution). We think it is indeed very likely that the "cell dissociation solution" is either removing or damaging these cell adhesion molecules on HUVECs. It is not clear what this solution is, but if it is trypsin or something similar to trypsin, this could be the source of your problem. HUVECs should be positive for ICAM-1 and VCAM-1, but the expression of those proteins can be low if the cells aren't stimulated by inflammatory mediators. Furthermore, we do not know if HUVECs express ELAM-1 unless stimulated in the appropriate manner. The following reference may help: Schatz F, Soderland C, Hendricks-Munoz KD, Gerrets RP, Lockwood CJ. Human endometrial endothelial cells: isolation, characterization, and inflammatory-mediated expression of tissue factor and type 1 plasminogen activator inhibitor. Biol Reprod. 2000 Mar;62(3):691-7. I would like to suggest that you try mixing the primary antibodies with your cells at room temp instead of on ice and as soon as I find out the recommended dilution for ab2213 I will let you know, thank you for your patience. 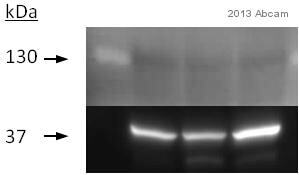 I just wonder why your antibody (selectin E-ab6630) only works under non-reduced condition in Western blotting. What is your "non-reduced" condition. Is there a protocol for immunohistochemistry available for this antibody? We are interested in using an antibody to E-Selectin in human endometrial tissue that is formalin-fixed and paraffin embedded. We want to know if there are any published results using this exact antibody for immunohistochemistry on any tissue. What is a good positive control tissue? Where abouts in the cell is the staining localised? Do you supply free samples for trial, or sell small quantities for trial? The antibody has been characterised extensively and published in: J Immunol 1990 Apr 1;144(7):2558-65 A monoclonal antibody that detects a novel antigen on endothelial cells that is induced by tumor necrosis factor, IL-1, or lipopolysaccharide. Wellicome SM, Thornhill MH, Pitzalis C, Thomas DS, Lanchbury JS, Panayi GS, Haskard DO. J Immunol 1990 Aug 1;145(3):865-72 IL-4 regulates endothelial cell activation by IL-1, tumor necrosis factor, or IFN-gamma. Thornhill MH, Haskard DO. It's use in immunohistochemstry has been described in: Am J Physiol 1994 Jan;266(1 Pt 2):H278- Characterization of E-selectin expression in vivo with use of a radiolabeled monoclonal antibody. Keelan ET, Licence ST, Peters AM, Binns RM, Haskard DO.